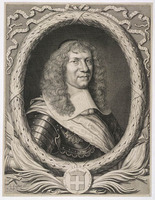 ANDIGNÉ DE GRANDFONTAINE, HECTOR D’, officer in the Carignan-Salières regiment (1665–68), governor of Acadia (1670–73); baptized 17 May 1627 at Ruillé-Froid-Fonds in Mayenne, son of Hector and Anne d’Andigné de Grandfontaine; d. 6 July 1696 at Brest. Grandfontaine belonged to a very old noble family from Anjou. Some time before 1565 his paternal grandfather, Gaston d’Andigné, had acquired the property of Grandfontaine of which his descendants took over the name also. The youngest of four sons in a family which included many soldiers, Hector naturally entered upon a military career and became a knight of Malta. On 17 Aug. 1665 he arrived at Quebec as a captain commanding a company of the Carignan-Salières regiment. The following October he supervised the building of a road along the Richelieu between Fort Saint-Louis (Chambly) and Fort Sainte-Thérèse. 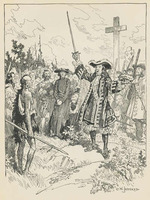 After a winter at Quebec, he took part in the campaign led by Prouville de Tracy and Rémy de Courcelle against the Mohawks and on 17 October signed the report of the taking-over of their territory (BRH, XIII (1907), 350–51). 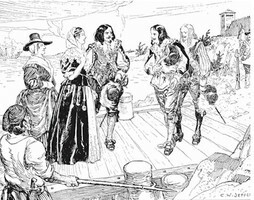 Talon recommended him among “the officers who deserve to be singled out for recognition,” and probably took him back to France with him in the autumn of 1668. The following year, when consideration was being given to forming companies of troops for the defence of Canada, Grandfontaine, along with four former officers of the Carignan regiment, offered his services to raise a company, with the intention of acquiring a land grant and settling down in Canada. 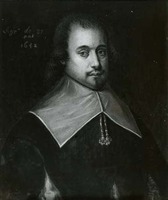 His offer was accepted, but instead of returning to the St. Lawrence, Grandfontaine was destined to go to Acadia, whose restitution to France, which had been decided by the Treaty of Breda (1667), had been held up until then by Sir Thomas Temple’s opposition. He was commissioned by the king on 22 July 1669 to receive this restitution, but he was unable to leave immediately. The following spring (20 February), he was appointed governor for three years and embarked upon the Saint-Sébastien at La Rochelle with his company. He was the first French governor of Acadia after the English occupation of 1654–70. As the English governor, Temple, resided at Boston, Grandfontaine went there and was courteously received. He presented the letters from Charles II and Louis XIV with which he had been supplied, and on 7 July 1670 he signed with Temple an agreement settling the conditions of the restitution. He then went to accept the return of Pentagouet by Richard Walker (17 July) and sent his lieutenant, Pierre de Joybert de Soulanges et de Marson, to take over the forts at Jemseg (27 August) and those at Port-Royal (Annapolis Royal, N.S.) and Port-La Tour (2 September). While leaving him free to set up his principal post wherever he judged appropriate, his early instructions, drawn up by the intendant of Rochefort, Colbert de Terron, showed clearly a preference for Pentagouet, in order to hinder the encroachments of the English. Grandfontaine accordingly established his capital there. The choice of this site, lying in disputed territory and separated by the Bay of Fundy from the main settlement at Port-Royal, would create serious difficulties; but Grandfontaine was only obeying the instructions that he had received. As soon as he had settled in, he dispatched a report to the king and the minister, sending them several maps and memoranda. In his reply of 11 March 1671 Colbert laid down a very precise programme, reminding him that he was to act only upon the orders of the governor and the intendant of Canada. This subordination to multiple authorities, in France and in Canada, made action on his part difficult, and it was not easy to please all these superiors. Intendant Talon was fortunately interested in Acadia, and there was consequently a serious and concerted effort on both sides to take this colony in hand again and to develop it. The most urgent task was to restore order and to meet the needs of the settlers. 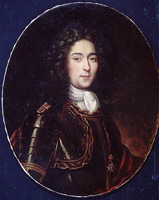 For twenty years the disputes among the heirs of Charles de Menou d’Aulnay, Emmanuel Le Borgne, and Charles de Saint-Étienne de La Tour, and the absence of a governor had given rise to a sort of anarchy. The population of Port-Royal, abandoned to its own resources, was managing to live off its crops and its herds, but lacked clothes and tools. Isolation had also developed the spirit of independence. Grandfontaine first revoked the authority of the seigneur Alexandre Le Borgne de Belle-Isle, whose misdemeanours had caused complaints, and enjoined the settlers to live in peace until a representative of the king could arrive to settle their disputes and lay down statutes for them. The supplies that he had brought from France and those that he obtained from Quebec or Boston provided for immediate needs. He also concerned himself with having boats built, while Talon asked for looms for the settlers. The main effort was directed to populating the country. In addition to the soldiers and indentured employees who had arrived with the governor, the Oranger brought 60 passengers the following year, among them one woman and four girls, and the court paid 100 livres each for their passage and their setting-up. The soldiers seemed to like the country, for in the following years some 15 thought of settling there. It is impossible to determine exactly how many new settlers took up residence in Acadia at that time, but it was certainly the greatest number to arrive since the time of Razilly and d’Aulnay. Being in too exposed a position and provided with too little arable land, the settlement at Pentagouet did not last long, but several of its members were to be found later settled at Port-Royal and Beaubassin (Chignecto). In order to provide better for the mutual defence of Acadia and Canada, Talon had conceived the plan of establishing a direct link between the Bay of Fundy and the St. Lawrence by opening an inland route and establishing a series of habitations as stopping-places. Two routes were available: the Kennebec or the Saint John River. To reconnoitre them Talon sent from Quebec his secretary Patoulet and two teams commanded by Daumont de Saint-Lusson and Louis de Niort de La Noraye. For his part Grandfontaine sent two Frenchmen and two Indians in the direction of Quebec and established a first group of settlers at the portage at Kidiscuit. The route by the Kennebec to the Chaudière proved to be too difficult and not very dependable. Preference was given to the Saint John River route, which was already much used, and as early as 1672 the government of New France granted seigneuries along it to the Joybert brothers and to Jacques Potier de Saint-Denis, while Martin d’Aprendestiguy, Sieur de Martignon, who had settled at the mouth of the river, was confirmed in his rights. The minister, Colbert, had asked for an annual census of the population. Grandfontaine entrusted this survey to Father Laurent Molin, a Cordelier, parish priest of Port-Royal. This is the earliest extant list of Acadian settlers. It shows about 400 people living at Port-Royal, Cap de Sable, and on the east coast, but does not mention the new settlers at Pentagouet and on the Saint John River, so that in 1671 the total population of Acadia, including the garrisons, must have amounted to about 500 persons. This figure shows clearly the smallness of the colony. The Treaty of Breda had decided only the question of the restitution of the forts, without fixing the boundaries of Acadia. Grandfontaine set these boundaries at the St. George River and flattered himself that by his honest dealings he could win for France the allegiance of the English settlers who were established on his side of the river. He sought to maintain the good relations with Boston which were necessary for him to obtain supplies. He bought a ketch from Temple, brought carpenters from New England, and granted fishing permits to ships from Boston. He endeavoured however to prevent English merchants from coming to barter for furs in French territory, had the fort at Pentagoet put back into shape, and maintained a garrison of about 30 men there, under the command of Jean-Vincent d’Abbadie* de Saint-Castin. Small detachments of about ten soldiers guarded the forts at Jemseg and Port-Royal. The only incident between the French and English was the capture of a French vessel coming from Jamaica, about which Grandfontaine sent his lieutenant to lodge complaints at Boston. The minister had also recommended that permanent fishing stations be set up, but Grandfontaine, busy establishing his settlers and reorganizing the colony, had no time to attend to the matter. On the whole, Grandfontaine’s brief governorship of Acadia was constructive. But his activity was hindered by serious disagreements with his lieutenant, Pierre Joybert de Marson, who complained about him. Moreover, Colbert de Terron accused him of being self-seeking. Yet Grandfontaine received only a small salary: 1,200 livres in 1670 and 2,400 the following year. It is possible that he engaged in commerce to add to his income and to meet the responsibilities of his office. We know for example that in 1672 famine raged at Pentagouet and that the governor had to send some men to spend the winter at Port-Royal. 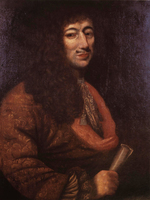 Having been recalled 5 May 1673 and replaced by Chambly, Grandfontaine returned to France the following December. Shortly afterwards he presented the intendant of Rochefort with a claim for 13,000 livres for expenses incurred during his service in Acadia. Terron, while he admitted that Grandfontaine had received funds from Rochefort for two years only and had kept the colony going for 36 months, refused to reimburse him, but suggested to the king that he be granted a post in the navy by way of consolation. The ex-governor thus obtained employment at Rochefort, became a lieutenant-commander, then a ship’s captain. He served on board the Intrépide in 1675 and took part in the expedition to Cayenne on board the Glorieux in 1676. He conducted himself bravely, was the first man to enter the town, and was wounded in the arm. The following year he participated in the Tobago expedition against the Dutch and broke an arm, which he lost the use of for the rest of his life. Subsequently he lived at Brest and received an annual pension of 800 livres. He was included in the first list of Chevaliers de Saint-Louis in 1693, and died at Brest 6 July 1696 leaving no heirs. AE, Mém. et doc. Amérique, 5, f.277. Archives de la Mayenne (Laval), B. 2278–3291, passim. AN, Col., B, 2, f.571; 3, ff.19, 41, 55; C11D, 1, ff.12, 139; 2, f.7; Marine, B2, 10, f.38. BN, MS, Clairambault 866, ff.326, 363; 1306, f.153; Mélanges Colbert 167, ff.92, 186; 175, f.392; 176, ff.85, 103; MS Fr. 26541, 31233, 31567. Correspondance de Talon, APQ, Rapport, 1930–31. Mémoires des commissaires, I, xxj; II, 316–23, 325–26; IV, 288–89, 291, 303–5; and Memorials of the English and French commissaries, I, 24, 604–10 et passim. BRH, XXIII (1917), 57–58. Murdoch, History of Nova-Scotia, 145–53. Régis Roy et Malchelosse, Le régiment de Carignan. René Baudry, “ANDIGNÉ DE GRANDFONTAINE, HECTOR D’,” in Dictionary of Canadian Biography, vol. 1, University of Toronto/Université Laval, 2003–, accessed April 21, 2019, http://www.biographi.ca/en/bio/andigne_de_grandfontaine_hector_d_1E.html.